P&G's Sarah Pasquinucci on why the diaper brand's Super Bowl ad strategy didn't include a TV spot. This year, Pampers went the non-traditional route of creating a Super Bowl ad that didn’t run on television. Instead, the diaper company released a social and digital-only ad featuring celebrity dads, including singers John Legend and Maroon Five’s Adam Levine, singing about changing their babies’ stinky diapers. "Somebody's got a stinky booty. Her name is Luna and she made a poopy." Those were the lyrics to a song Legend serenaded his daughter with while changing her diaper in a successful Pampers ad last summer. The company wanted to do a sequel of the ad as a celebration of dads and the changes parenthood brings. Enter Stinky Booty Duty 2.0. Brainstorming for the campaign began in November 2018. By early December, Pampers had settled on a concept strong enough to debut during Super Bowl LIII as an online-only ad. "Our goal was to use the nation’s largest advertising and social media stage to connect with parents - both moms and dads alike," said Sarah Pasquinucci, associate director of communications for North America Baby Care at P&G. Many Super Bowl ads are released, and covered by media outlets, ahead of the game, explained Pasquinucci. Because of this, she said, it is possible to generate buzz without actually releasing a TV ad, especially since people are looking at their phones while the game is on. "It’s a multi-screen experience," she explained. The Super Bowl is a crowded field for advertisers, so Pampers deployed a targeted, multi-tiered approach. It reached out to media well-in-advance of the Super Bowl. The brand used an aggressive pitching strategy that targeted outlets with parenting and entertainment verticals. On February 1, Pampers released a public teaser of the ad on its YouTube and social media channels featuring Legend and his wife supermodel Chrissy Teigen. The full spot - complete with the surprise appearance of Levine - was released on social media at 3 p.m. on Super Bowl Sunday, slightly ahead of kickoff. It is also on Pampers’ website. On social media, the ad’s three stars - Teigen, Legend, and Levine - all promoted the spot. 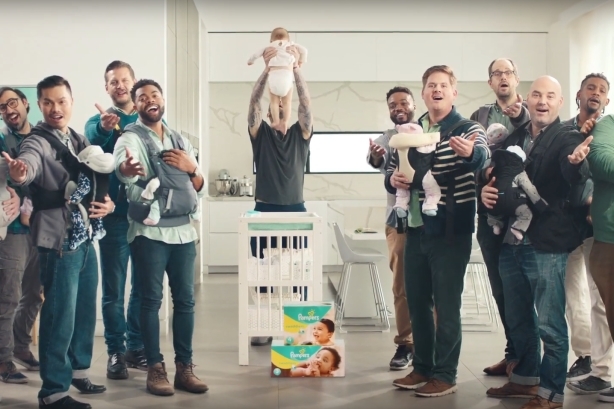 Pampers also tapped a number of dads in the NFL, including Kyle Rudolph, Sterling Shepard, Jalen Ramsey, Earl Thomas, and Jamaal Charles, who posted about the campaign on their own social channels. In the first 48 hours after it was released, the ad blew up, receiving over 46 million video views. The campaign also delivered 160 unique media placements, and, despite not airing on TV, was named one of the best ads of the Super Bowl by O, The Oprah Magazine, Billboard, Forbes, BuzzFeed, and the BBC. On social media, the campaign’s stars generated a frenzy of engagement. Teigen’s Instagram post of the video received 4 million views and 20,000 comments within the first 24 hours, and the video got engagement from celebrities such as Gwyneth Paltrow, Kris Jenner, and Reese Witherspoon. The Super Bowl activation served as the launch of the Pampers’ new campaign, Love the Change, which will continue through 2019.